Our formal service taken by Canon Christopher Samuels will be held at 12.00 mid-day in the chapel followed by a members and their guests lunch in one of the pods. Non-members/visitors are welcome to the service but please contact MVG Secretary Rosemary Fell rosemaryfell11@gmail.com to ensure a place. Surviving Far Eastern Captivity – how did they do it? To mark the 70th anniversary of the start of Far Eastern captivity, the 175-year-old lecture theatre of the historic Liverpool Medical Institution will be the venue for a special ‘matinee performance’. Featuring guest speaker, Emeritus Professor Sears Eldredge (Macalester College, Minneapolis, USA), with supporting acts, Professor Geoff Gill and researcher Meg Parkes (both based at the Liverpool School of Tropical Medicine). 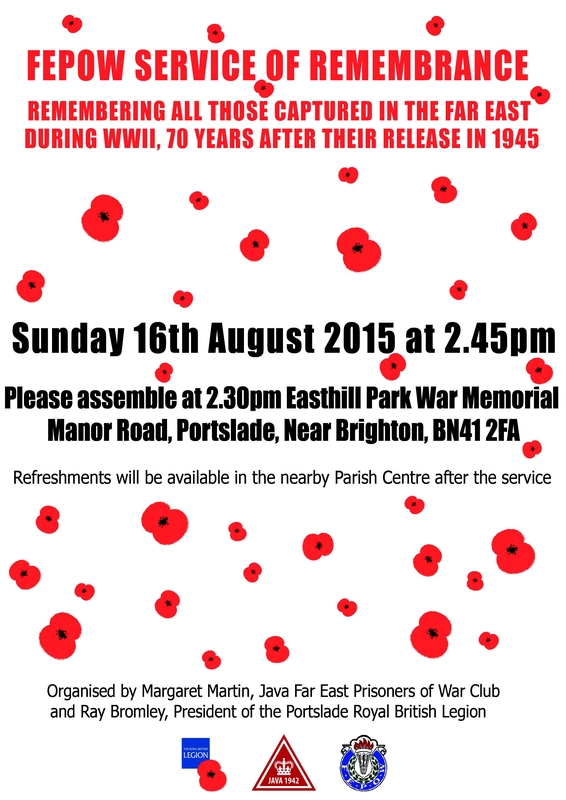 This one-off Far Eastern POW (FEPOW) history meeting takes place on Wednesday 19 September. The talks will turn the spotlight on different aspects of survival in captivity – the theatricals, smuggling and inventiveness – illustrating some of the key ways in which men survived captivity, both in the jungle camps of Thailand and beyond. Topics range from orchestras and concert parties, clandestine supply lines to medical and musical ingenuity. If ever proof were needed that ‘laughter is the best medicine’ then Professor Eldredge’s lecture surely provides it. Sears wowed delegates and speakers when he spoke at the 2008 Researching FEPOW History Conference. His exhaustive, vivid and entertaining lecture on concert parties in Thailand will be remembered by all who were there. This time he will share some interesting new discoveries and hidden treasures from his research for his e-book, “Captive Audience/Captive Performers “. He will give the audience an insight into the morale-raising, spirit-lifting performances, as well as the artistry and ingenuity of actors, set designers, technicians and programme makers. Professor Geoff Gill will present a talk entitled ”Stealing, smuggling, supplies and survival”, shining a spotlight on clandestine supply lines, such as the V-scheme that saved thousands of lives in Thailand, as well as other secret life-saving work. Professor Gill will reveal research undertaken for his PhD thesis, “Coping with Crisis, Medicine and Disease on the Burma Railway 1942- 1945”. Meg Parkes, a Far Eastern POW history researcher, will share more of her interviews with the FEPOW who, so late in their lives, shared details about the medical ingenuity and inventiveness they took part in or witnessed. Adapted from her talk “Tins, Tubes and Tenacity” Meg will include brief biographies of a couple of Merseyside medical men as well as new information concerning the hospital workshops at Chungkai and Changi. There is no charge for the meeting so you are advised to book early. To reserve places, complete the registration form below. NB After the lectures there is an informal reception followed by supper at the LMI. For directions and parking go to the LMI website – www.lmi.org.uk. Cost for the reception and supper – £18 each. Cheques (sent at the time of booking) should be made payable to: “Researching FEPOW History” and posted to Mike Parkes, “Kranji”, 34 Queens Road, Hoylake, Wirral CH47 2AJ. Email: mike.parkes@talktalk.net Tel: 0151 632 2017. To avoid postage costs supper tickets will not be issued until the day (together with receipts, if requested).